Julia Jacklin announced 2019 tour dates, including performances at Whelan’s in Dublin on Sat 30th Mar 2019. She also announces her new album ‘Crushing’ out 22nd February on Transgressive records. 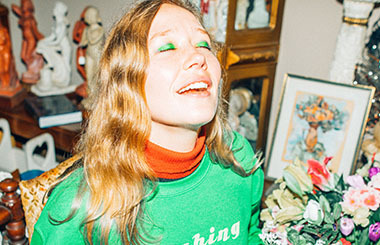 Australian singer-songwriter Julia Jacklin announces her new album, Crushing, will be released February 22nd, 2019, via Transgressive Records. To celebrate the announcement Jacklin shares new single ‘Head Alone’. A pointed and electrifying anthem of refusal, she sings “I don’t want to be touched all the time / I raised my body up to be mine”. Julia Jacklin also announces a 2019 UK and European tour which will see her take Crushing on the road shortly after its release. The tour kicks off in Brighton in March and follows on from a handful of sold out intimate live shows later this month. Full list below. I really like this album, I worked hard on it and I really like listening to it. That’s not usually how I feel after making something. I’ve finally come to accept that right now for me, making records is about capturing a time; who I am at that time, what I need to say in the best way I can say it, with minimal studio frills to cover it up. So I’m really happy to announce this one and ready for whatever things get thrown my way because of it. The cover was hard to figure out, seemed like I couldn’t think of what kind of image would represent the music in the right way. Hard deadlines always make me more creative surprisingly. I was on tour in the states with my best bud Nick Mckk who takes a lot of my photos, he took my first album cover. We pulled off the highway in Pennsylvania and found a town called Krumsville. There was an antique store with a very friendly owner who let us run free inside. I got the jumper made the day before in NYC, same day I decided on the album name. I think it works.